A parallel port interface (LPT1, LPT2) connects the programmer to any desktop PC running DOS or Windows systems. 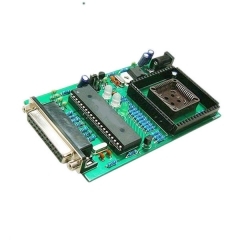 The four jumpers located on the programmer board are intending for device type selection. Smart firmware controls all read/program operations so access to device can be establish even if device secured. Default settings permit to read and write Motorola MCU internal EEPROM without processor structure knowledge. The Device Menu displays all available functions to perform on the device (read, program, verify, program security, etc...). A full screen editor is provided to view or edit any address of the programming buffer in binary or ASCII formats.